The massage has been using for centuries and is considered as the most effective tool that allows you to preserve health. Therefore, in the last ten years, we see the rise in popularity of massage. There is no doubt about the positive influence of the massage on the health. Unfortunately, to people who massage is essential, especially those who lead an active lifestyle, oversaturated stressful situations, usually can not find free time to visit the massage parlor. Therefore, here is a five-minute finger massage that works at any time, at any place, at home, at work, on vacation. It is simple and gives the maximum positive effect in minimum time. The fingers massage can relax your tense muscles; we will be more capable for working and happier. Our fingers are constantly working for us, so they are always with bunch of tension, and with the years become less mobile and flexible. Loosen them and from them will come out the tension piled up in our body. Catch the little finger with the thumb and forefinger; gently shake it to remove muscle tension. Then, until you feel pleasantly, turn the little finger in a clockwise direction. After 10 seconds change the direction of moving. Thereafter, in the same way and do this exercise with your other fingers on the hand. With pressing the root of the thumb, you can increase the life tone. At the end of the thumb is placed a reflex zones that is related with the lungs and acting on it will help to free up the airways and nasal cavity. 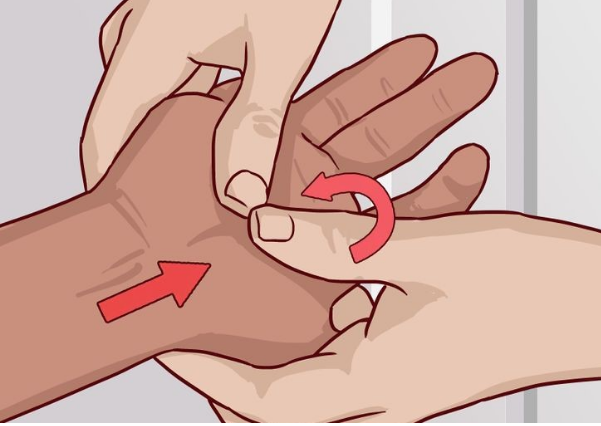 Squeeze the hand into a fist, but so that it can remain an empty space inside and place your thumb of the other hand. Gather the fist firmly, drew the thumb and gently pull as if you trying to stretch it out. Then do the same with your other fingers. At the end shake tour hands. It is necessary for them to feel the warmth and relaxation.